In our continued efforts toward exceptional customer service and transparency, we have prepared the following reports. 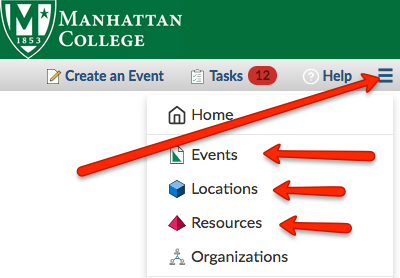 These reports will be displayed on ITS Blog, the ITS Website, and on inside.manhattan.edu Quick Links. This report displays all rooms currently experiencing issues, with brief descriptions of issue and current status (Ticket Summary). Knowing ahead of time of classroom issues can help you mitigate how to handle your classes. This is a series of links to reports generated by our ticketing and project management system. It includes data with regard to our service delivery statistics but also contains information with regard to rooms that are currently facing technology issues. For more details please review the ITS Service Catalog and ITS Knowledge Base. Are you still running a really old version of Microsoft Office on your personal device? Have you been avoiding an upgrade to avoid having to pay for it? Well now you no longer have an excuse for not upgrading. We've worked with our Microsoft representatives to make Office 365 available to you for free on up to 5 personal devices. This Knowledge Base Article walks you through the process of creating an account on Microsoft's portal. The entire process takes about 5 minutes. It's simple and quick. Once you've created an account, you can install Office 365 on up to 5 personal devices for free. The issue with Banner Self-Service has been resolved as of 9:37AM Monday August 27, 2018. ITS has identified an issue with Banner Self-Service. We are currently investigating the issue and will provide an update when the issue is resolved. We would like to welcome everyone back to campus and trust everyone had a relaxing and restorative summer break. The new computers are small form factor, they will be placed on top of the tables behind the monitors, the new set up allows for more leg room and the computers will be easier to turn on. Converting the Research and Learning Center 205 Conference Room into a latest generation classroom with a computer and a new Kramer VIA GO wireless presentation system. Leo 259 was converted to a latest generation classroom with a computer, laser projector and AirPlay Version 2 powered by Kramer VIA GO wireless presentation system. Leo 3rd Floor Lab received 6 new computers. Reynolds Room: Renovations consisting of 35 new computers, monitors and a Kramer Wireless presentation system are in progress and scheduled to be completed by the end of September. This timeline may change. Our goal of improving classroom presentation technology has led us to an improved wireless presentation system in our classrooms: AirPlay Version 2 (Powered by Kramer VIA GO) will allow instructors and students to connect and present to a main display via any laptop or mobile device and edit documents and stream video. In order to make the transition to this new system more seamless, we decided to stick with the AirPlay branding that the Manhattan College community has become familiar with over the past few years to be synonymous with our wireless presentation system. The Jamboard in the Charter Room has been replaced with a 65” inch HD TV on a stand and the Kramer VIA GO wireless presentation system. In addition, Chromebox for Meetings has been installed in the Charter Room. Kelly Commons 5th floor control units were updated to a new and easier to use interface. Faculty and staff were able to dive deeper into Google Apps by participating in an 8 week Google Collaboration Challenge (#GSuite Collab). Participants who rose to the challenge not only improved their Google skills in Google Drive, Docs, Calendar and Forms but were awarded a Credly Digital Badge. The training materials are in an online Moodle Course: Google Summer Collaboration Challenge, for those wishing to improve their Google Skills this semester! ITS Service Report link takes you to a series of links to reports generated by our ticketing and project management system. It includes data with regard to our service delivery statistics but also contains information with regard to rooms that are currently facing technology issues. Not sure if a classroom issue has been resolved? Click here for an up to date Room Issues report: Complete with details on current status of each room that has an issue. A Student Technology And Resource Specialist (STARS) is a Manhattan College student who exemplifies Lasallian values by utilizing their unique skill set to assist members of the Manhattan College community. A STAR has a combination of excellent interpersonal communication skills and technology knowledge. STARS show compassion when working with members of the community who are having technical difficulties. STARS will be going through ongoing training this Fall and upgrading their technical skills in order to offer even stronger support to the Manhattan College community. Managers are organizing training and a student management hierarchy with the continued goal of a 90% student run Client Services department in the upcoming Fall 2018 semester. Have a question? Check out our Knowledge Base first. How to Update Your Personal Email. Remember that we will never ask you for your password. We encourage you all to please reset your computer password and provide the temporary password to ITS prior to dropping it off at Client Services. If you do not do this prior, please allocate an extra 5 minutes to work with a Client Services representative so that we can assist you in changing your password when working with us. Upon completion of work on your computer, please allocate another 5 minutes so that a Client Services representative can assist you in changing your password back to its original state. This is necessary in order to safeguard your password. Remember that you should never give your password out to anyone under any circumstances. Note that the same procedure holds true when you are requesting assistance with one of your Manhattan College accounts. For more details about best practices for keeping your information secure at Manhattan College click this Cyber Safety link found on the ITS website. Client Services can NOT lend out equipment to students. If a student needs equipment for a project, they must have a Manhattan College employee sign out equipment on their behalf. Note that the Manhattan College employee is responsible for that equipment. Client Services can provide short-term loaner equipment such as laptops and projectors by reservation. Note that if equipment is needed long term, it should be purchased via your department. In lieu of loaning certain cables and remotes, Client Services has installed commonly used VGA and Audio cables as well as projector remotes in all yet-to-be-renovated classrooms. Network cables will be provided to faculty upon request. Faculty requiring other specialty cables or adapters (such as Apple VGA adapters) should contact Client Services for assistance purchasing this equipment as they are not stocked or provided by Client Services. The Client Services office does not work on personal computers. We will train employees and students and instruct them on how to fix their computers, but personal computers cannot be dropped off for service. No personal items should ever be left in any of the Client Services offices. Please remember to plan event setups in advance. We work with limited resources so we cannot always complete last minute requests. Client Services currently has 3 convenient locations: Jasper Basement, O’Malley Library Circulation Desk, & RLC 103C. Please stop by the location closest to you. We encourage you to call first to be sure that someone is available as we are constantly assisting the Manhattan College community. Client Services Hours of Operations can be found here. Computer Lab Hours can be found here. Campus-owned computers are purchased with hardware support provided by the manufacturer. ITS will diagnose and determine whether manufacturer hardware support is needed. For the fastest service, clients are also able to contact the manufacturer directly to access hardware support and replacement. Check out our Manhattan College ITS Blog. Thanks and wishing everyone a productive semester on behalf of the ITS team! Client Services will be providing priority support to classroom and network support requests from Monday, 8/27 - Friday, 9/7. Response times for all other requests will be slower than normal. We apologize for any inconvenience. Digital Accessibility is the practice of insuring that all people, including those with disabilities, can access and use our electronic resources and communications. Digital accessibility is very important, because not only is it the law, it promotes a more inclusive experience for all people using the web. Utilizing practice that promote digital accessibility helps those with hearing difficulties, visual difficulties, cognitive & neurological disabilities, and physical disabilities. Although we tend to center our discussion of accessibility on people with physical impairments, we can all relate to the experience of using an interface that is not accessible to us for other reasons. Have you ever had a problem using a desktop site on a mobile phone, or seen the message "This content is not available in your area," or been unable to find a familiar menu on a tablet? Those are all accessibility issues. The text is low contrast, which is hard for people with low-vision to read. Having labels on the left and fields on the right makes it hard for many people to associate them, and almost impossible for someone who needs to zoom in to use the page. Imagine looking at this on a phone and having to pan around to figure out what goes with what. The "Remember details?" label isn't associated with the checkbox, so you have to tap or click only on the tiny square rather than just clicking on the label; also, someone using a screen reader would have trouble figuring out the association. Now let's wave our accessibility wand and see the form with those issues fixed. We are going to make the text darker, modify the design so the labels are close to the things they are labeling, and fix the label to be associated with the checkbox so you can toggle it by clicking the label as well. Which would you rather use? If you said "the accessible version," you are on your way to understanding a main premise of this guide. Often, something that's a complete blocker for a few people is also a pain point for many others, so by fixing the accessibility issue you improve the experience for everyone. Why is it important to make sure that online content is Digitally Accessible? What are some of the electronic resources that have to be accessible? Please note, for planning purposes, it will take approximately 30 minutes each week to review the material and take a questionnaire based on the content. Participants who complete all 5 weeks of content and weekly questionnaires will be awarded a Credly Digital Badge. Moodle's Course visibility setting determines whether the course appears in the list of courses and whether students can access it. 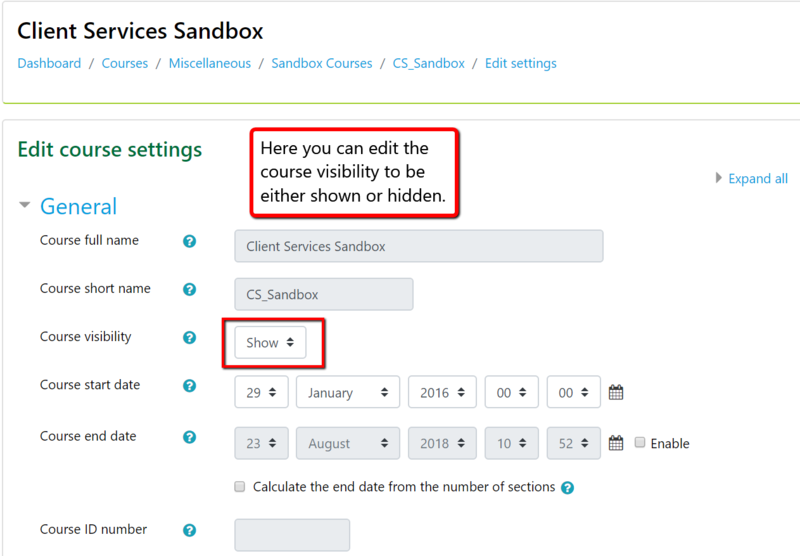 If set to Hide, then access is restricted to users with the capability to view hidden courses (such as teachers). This is useful for when you want to hide a course before the semester starts or after the semester ends. Often times this might be set to Hide without you even knowing, leading to confusion about a student's access to a course. To check or modify your course visibility, please follow these steps. Click into the course that you wish to make visible to your students. On the right side of the screen, there is a gear icon that you must select. Under the drop down menu that appears, you will select Edit settings. Once the Edit course settings menu appears, you will see the General settings. There you will find the Course visibility option. Set the Course visibility to Show. This will now make your course visible to students. For further details, please refer to this Making a Moodle Course Visible KBA. Fall semester classes will display in the "In progress" tab. Current courses will be listed on the default "In progress" tab. Courses that have ended are listed on the Moodle Dashboard in the "Past" courses tab. Hint: If your class is not showing check "Past"
UPDATE2: As of 11:30am, this generator test and brief network outage has been completed. UPDATE: This generator test has been moved to Friday, August 24th at 10am. Physical Plant will be conducting a generator test in Horan Hall on Thursday, August 23rd at 10am. These tests are conducted throughout the year to ensure the generators function correctly in case Horan Hall loses power for any reason. This test will last for approximately 15-30 minutes and will affect both the wired and wireless networks in Horan Hall. During this test the network will go down twice, once when switching to the generator and a second time when switching back to building power. To assist new and existing Moodle users, Instructional Design will be offering the following Moodle training sessions in the coming weeks. All sessions will take place in O'Malley 410. These 45 minute sessions are intended for existing Moodle users and will focus on acclimating users with the new interface and features found in Moodle 3.5. These sessions are intended for new Moodle users or those that would like to receive a refresher on the basics of Moodle. Starting Aug 27, ITS will be releasing a series of weekly tips aimed at spreading awareness and improving Digital Accessibility skills within the Manhattan College Community. Each week, a variety of infographics, videos and examples will be available for 5 weeks beginning with the start of the 2018-2019 academic year. The Digital Accessibility challenge will also be posted in the ITS blog each week. The objective of the challenge is to give participants the tools you need to apply what you learned in actual situations. Whether you are on campus or at home - student or employee - anyone can participate! The 5-week Digital Accessibility Challenge will include an overview and best practices to promote Digital Accessibility. Participants will have the opportunity to complete each phase of the 5-week challenge at their own pace - all at once, or as topics are released. Track your progress by completing a short questionnaire at the end of each challenge and earn the 5 -week Web Accessibility badge at the end of the program! A digital badge is a way to communicate and track achievement, they make your credentials portable and your skills more visible. You can put the Digital Badge on your resume or link to your LinkedIn account. These badges or digital certificates, are issued by Manhattan College and they do not expire. UPDATE: There was a power issue that services the networking equipment in Draddy Gymnasium. This caused the network to be down for both Draddy and Alumni Hall. This issue has been resolved and the network has been restored in both buildings. We apologize for any inconvenience that this may have caused. ITS has been made aware of a network outage affecting both Draddy Gymnasium and Alumni Hall. We are currently investigating the issue and will update the College community as soon as we can. A New Moodle with New Look and Features! 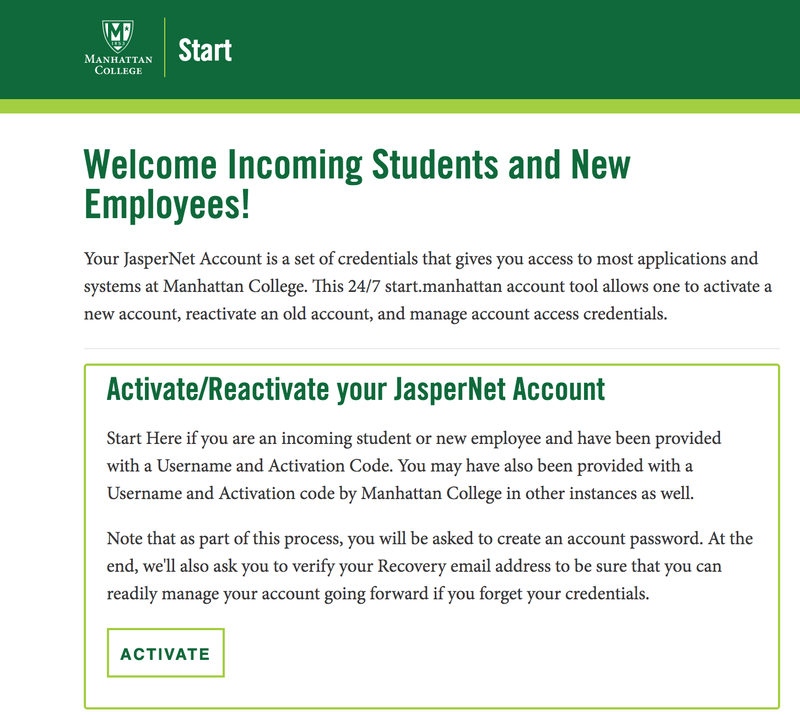 Come Monday, 8/20, Manhattan College's Moodle Course Server will have a new look, and with it some nice new features! The upgrade of the Moodle course management system (from Moodle 3.1 to Moodle 3.5) comes with a cleaner and more modern appearance, thanks to a new core theme upon which Manhattan College's customization is now built. The new theme has been designed to improve the overall user experience of Moodle across desktop and mobile devices and it comes with a new navigation system, course layout and convenient editing options. A few things for you to note is that you will now have a left slidable navigation drawer that can be opened and closed using the Hamburger Icon (button with 3 small horizontal lines). This will allow you to have more screen real estate on your computer, tablet or phone when viewing your Moodle content and to quickly move between your classes. With the new theme, Moodle is aiming towards a unified (harmonised) experience with the Moodle Mobile app (to be rolled out here at Manhattan College at some point in the future). 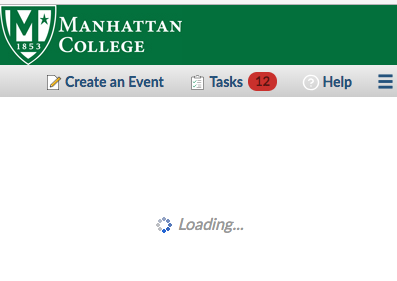 The Manhattan College Moodle system will be OFFLINE for system maintenance starting at 5AM on Monday 8/20. During this time, important system updates will be applied in preparation for the 2018-2019 academic year. We anticipate that the maintenance will be completed between 5AM - 11AM during which time the Moodle system will be UNAVAILABLE. Please be advised that this Friday night, (08/17/2018) Information Technology Services will need to take Banner Production offline between 9:00pm - 12:00 Midnight to apply a database patch recommended by Oracle. All outages reported this morning have been or will soon be resolved. AirPlay 2 Kramer VSM should be up shortly. Papercut and Turing are back up. ITS is currently experiencing an outage on our Papercut servers. Printing is momentarily down until further notice. We are currently experiencing an outage of the Turing system. We are investigating. ITS discovered that the Kramer Via Site Manager (VSM) Server is down as of 8:15AM. Our team is investigating. In the meantime, you should be able to connect to Airplay in these rooms and also via the Alternative Method outlined in documentation. I am happy to report that the 25Live Mobile Homepage issue reported earlier this week was resolved by Collegenet yesterday at 2PM. The issue affecting JasperNet Authentication (SSO login) has been resolved. 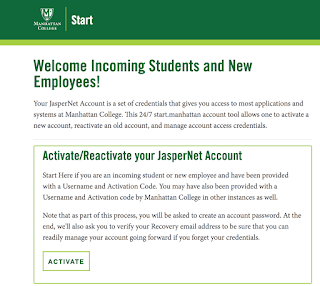 ITS has identified an issue affecting JasperNet Authentication (SSO login on secure.manhattan.edu). As a result, users attempting to sign-in to JasperNet services are being issued an "Authentication Failed. Try Again" error. We are aware of the issue and working to resolve.